If there’s one thing that unites crafters, it’s a messy craft room. Wit so many supplies, we know it can be tough to keep things in order, so this year, put on your organization hat and do some rearranging. One tip we recommend is to put things in clear containers so you can easily identify what’s in them. 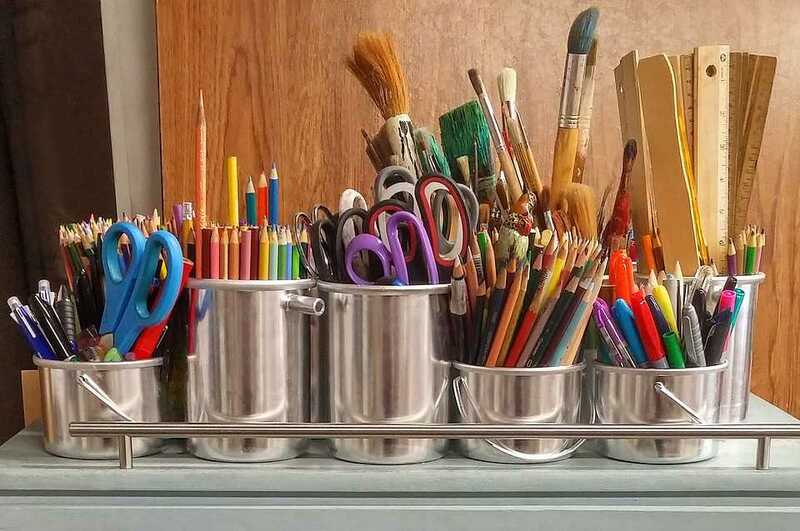 Arts & crafts is all about creativity, so why not make it a point to learn something new? Whether it’s knitting, painting, woodworking, or something else, you’ll develop a new skill and have fun in the process. Have you always wanted to work with clay? Maybe you’ve never drawn with charcoal. Or maybe string art has been calling to you. One of our favorite New Year’s resolutions at our embroidered patch company is the resolution to try and create something with a new medium. Who knows – it may be your new favorite hobby! Homemade gifts are some of the best gifts you can give, so this coming year, create something special for your family member, friend, coworker, loved one, or someone else who would love a thoughtful, hand-crafted gesture. There’s something very rewarding about selling a piece of artwork you’ve drawn, painted, or created. If you’ve never done it before, make it a point to this year. Not only will you make some money, but you’ll gain a boost of confidence and happiness. We’ve all done it – we’ve all begun a project and then halfway through, stopped and never picked it back up. This year, make it a point to not leave anything unfinished. Push yourself to complete what you started and not simply become lazy. One of the easiest things to do is keep extra supplies around after you’re done with a project, however, this can lead to a plethora of things you don’t use very often. Do yourself a favor and create something using old supplies. You’ll be glad to get rid of some of your leftovers. Part of the fun of crafting is teaching others how to do it. If you have a friend or family member who’s always wanted to learn how to sew, build a birdhouse, paint a decor piece, or quilt, take some time and teach them. Kids are adventurous and creative, so why not push them to explore their skills using crafts? You’ll get to spend some quality time together and make something memorable. At our embroidered patch company, we know it can be easy to spend too much money on crafting supplies. After all – crafting is fun! If you’re known for buying too much or you simply want to save your money, make a resolution to spend less. This entry was posted in For Fun and tagged artwork, crafts, DIY, sewing, thread, wood.